Albert Jojuan Belle (born August 25, 1966) is a former American Major League Baseball outfielder for the Cleveland Indians, Chicago White Sox, and Baltimore Orioles. Standing at 6 feet 2 inches (1.88 m) and weighing 225 pounds (102 kg), Belle was one of the leading sluggers of his time, and in 1995 became the first and still only player to ever hit 50 doubles and 50 home runs in a single season. He was also the first player to break the 10-million-dollar per year compensation contract in Major League Baseball. Belle was also considered a model of consistency, compiling a .295 career batting average, and averaging 37 home runs and 120 RBIs a season between 1991 and 2000. Belle is also one of only six players in MLB history to have nine consecutive 100-RBI seasons. However, his combative personality, marked by occasional angry outbursts, created a reputation that was intimidating to those who covered him in the news media. Albert and his fraternal twin, Terry, were born on August 25, 1966, in Shreveport, Louisiana, the son of Albert Belle Sr., a high school baseball and football coach, and Carrie Belle, a former math teacher. A former Boy Scout, he attained the rank of Eagle Scout. Belle attended Huntington High School in Shreveport, where he was a star baseball and football player, a member of the National Honor Society and vice president of the local Future Business Leaders of America. He also played little league baseball with future PGA Tour player David Toms. He graduated sixth in his high school class and made the all-state baseball team twice. In 1984, he was selected to play for the USA in the Junior Olympics, in which the U.S. won a silver medal. He played outfield and pitched, winning one game. After graduation, Belle was offered many football and baseball scholarships, including one to the University of Notre Dame; he was also offered an appointment to the United States Air Force Academy. However, Belle decided to stay close to home, and accepted a baseball scholarship to Louisiana State University. Belle was an intimidating presence at the plate; and well known for wearing an intense glare. He became the fourth player to have eight straight seasons of 30 home runs and 100 RBI, joining Babe Ruth, Jimmie Foxx and Lou Gehrig (a feat since matched by Albert Pujols and Alex Rodriguez). He was an accomplished baserunner and base stealer, with a career high of 23 steals in 1993, and a surprising 17 steals in 1999 despite hip problems. He led the league three times in RBIs, three times in total bases, three times in extra-base hits and twice in slugging. He was a five-time All-Star between 1993 and 1997. As a fielder he had a powerful throwing arm, unsurprising given that he was a gifted pitcher in high school. His range factor by games played was consistently higher than the major league average range factor at that position; nevertheless, he still managed to accrue a -12.5 defensive WAR during 12 major league seasons. Notably, Albert Belle's career highs in home runs, RBI, batting average, runs scored and walks occurred in five separate seasons. In 2006, the Hardball Times published a statistical comparison of Belle's career statistics with that of 60 of his current and former peers. The article ranked him in career "prime value", behind current Hall of Famer Ralph Kiner and recent inductee Frank Thomas. In 1994, he lost the batting title to New York Yankees outfielder Paul O'Neill, .359 to .357. His postseason record was limited to two heavy-hitting appearances, in which only his batting average suffered: he hit .230/.405/.557 (batting average, on-base percentage and slugging percentage, respectively) with six home runs and 14 RBIs in 61 at-bats. In 1995, he became the first player in major league history to hit 50 home runs and 50 doubles in the same season; the last player before him to reach as many as 40 in both categories had been Willie Stargell in 1973. The achievement was especially impressive because Belle played only 143 games in 1995 due to a season shortened by the previous year's player strike. The 40–40 mark has been surpassed since, most recently by Chris Davis in 2013, but Belle's 50–50 combo remains unique. His reputation, and more specifically his disdain of the media, cost him votes for the 1995 MVP Award The fact that he was caught cheating the year before, in the infamous 1994 Bat Burglary, didn't help his cause either. 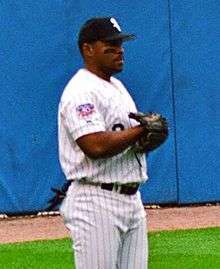 He finished second in the media voting to the Boston Red Sox' Mo Vaughn even though he led the American League that season in runs scored, home runs, RBIs, slugging percentage and total bases, and outpaced Vaughn head-to-head in every important offensive category except RBI (both men had 126); both players' teams reached the playoffs. This was in the middle of a three-year streak in which Belle finished 3rd, 2nd and 3rd for the American League MVP. Belle had two other top ten MVP finishes, in 1993 (7th) and 1998 (8th). In the winter of 1996, he signed a 5-year, $55 million ($81,211,650 today) deal with the Chicago White Sox as a free agent. This contract made him the highest paid player in baseball for a brief period. He enjoyed two great seasons in Chicago, including a career-high 27-game hitting streak in May 1997, and came close to another 50/50 season in 1998 with 49 home runs (a White Sox team record that still stands) and 48 doubles. He also drove in 152 runs to break Zeke Bonura's single-season franchise record of 138 in 1936 (to date, the RBI total also remains a White Sox single-season record). Additionally, when Cal Ripken, Jr. ended his record consecutive game streak at 2,632 in September 1998 on the last day of the season, it was Belle who took over as the major leagues' active leader in the category. His White Sox contract had an unusual clause allowing him to demand that he would remain one of the three highest paid players in baseball. In October 1998 he invoked the clause, and when the White Sox declined to give him a raise he immediately became a free agent. He again became the game's highest paid player, signing a five-year, $65 million ($92,488,014 today) deal with the Baltimore Orioles. But his career ended just two seasons later when he was forced into retirement at age 34 by degenerative hip osteoarthritis. He was, however, kept on Baltimore's active 40-man roster for the next three years as a condition of the insurance policy which largely reimbursed the Orioles for the remainder of his contract. Belle was suspended in 1994 for using a corked bat, and gained further notoriety for sending teammate Jason Grimsley through the building's ceiling panel to break into the locked umpires' dressing room to retrieve his corked bat and substitute it with another teammate's bat, resulting in a seven-game suspension. The revelation of Belle's use of corked bats was given more emphasis when Cleveland teammate Omar Vizquel wrote in his autobiography that it would be naive to suggest otherwise and that "...all of Albert's bats were corked." He was fined in 1996 for knocking down Brewers infielder Fernando Viña, who had blocked his way between bases. He also had unpleasant interactions with the public, once chasing down rowdy trick-or-treating vandals who were celebrating Halloween by throwing eggs at his home, hitting one of the vandals with his car. "Sorry, there'll be no words of sympathy here for Albert Belle. He was a surly jerk before he got hurt and now he's a hurt surly jerk....He was no credit to the game. Belle's boorish behavior should be remembered by every member of the Baseball Writers' Association when it comes time to consider him for the Hall of Fame." ↑ "Albert Belle Statistics". Archived from the original on 8 August 2008. Retrieved 2008-08-06. ↑ Smith, Claire (November 20, 1996). "Belle Signs the Richest Deal: 5 Years, $55 Million". New York Times. Retrieved January 13, 2015. ↑ "Albert Belle Quotes". CNNSI. Retrieved 14 October 2013. 1 2 Hoynes, Paul (28 February 2012). "Albert Belle enjoys a laugh-filled reunion with the Cleveland Indians". The Plain Dealer. Retrieved 5 November 2012. ↑ "Albert Belle Quotes". Baseball Almanac. Retrieved 6 August 2013. ↑ Enders, Eric (April 23, 2001). "In Defense of Albert Belle". Retrieved July 10, 2013.